The Terra XTREME is a cutting edge mobile soil pulverizer that aerates topsoil, dirt, and other organic material, through a screen, into the fine product you need. A continually refined and updated design is simple to use and easy to maintain. Learn more about our unique compost grinder and pick the one that works best for your needs. The Terra XTREME is a cutting edge mobile soil pulverizer, featuring a continually refined and updated design, yet is simple to use and easy to maintain. Our pulverizers are the result of decades of field use, and results driven engineering alterations. 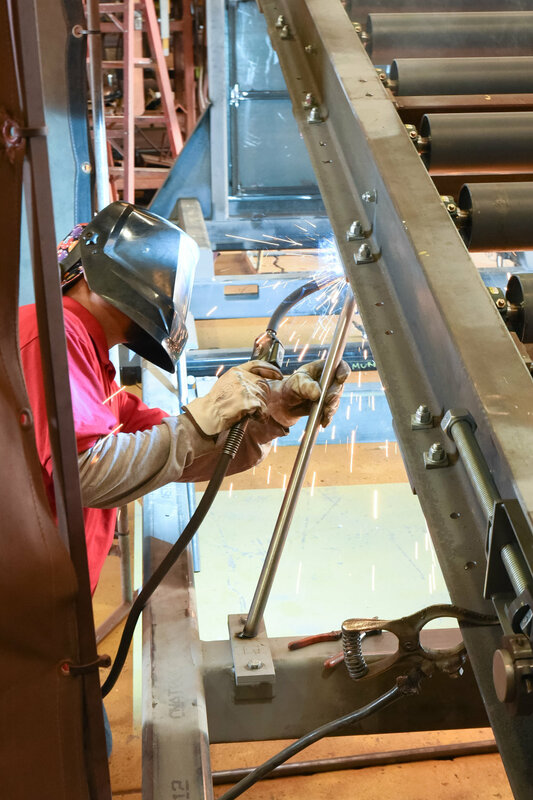 We take pride in our ability to customize each of our machines to best fit an individual customer’s needs. Each is hand built in our manufacturing facility in Oklahoma City. A Terra XTREME can help to reduce the amount of equipment on your yard. It is a flexible workhorse that can be operated by one man and can be loaded and transported with relatively basic supporting machinery. The machines are easy to maneuver around a worksite. All models are road legal, include high visibility badging, and are as stable to tow as a large mobile home or boat. Our machines are designed to be simple to use and maintain. All controls are visible and labeled. One person trained in the operations can run and monitor the machine, as well as load the material. Maintenance is also designed to be very simple, and as easy as possible. The number of moving parts has been designed down to a working minimum, with friction leading to most wear and tear of an acceptably maintained machine. Monitoring gear lubricant, engine condition, tire tread, conveyor condition, upper knives, hammers & hammer-rods, and hammer-mill disks are the primary maintenance needs. The Terra XTREME is available with the following power packages: Tier III Diesel engine, Tier 4 Final Diesel engine, and Electric motors. The Terra XTREME is available for international sales. The smallest and lightest of the Terra XTREME lineup. The 3125 is a highly mobile soil pulverizer. Designed for ease of use, the 3125 features a loading height of just 6’8' - comfortably within the range of a bob cat or skid steer loader. The 3125 possesses a processing capacity of up to 125 cubic yards per hour. Designed with the environmental remediation industry in mind, the Terra Xtreme Environmental is equipped with a number of design alterations specific to this model. Installed in place of upper knives, a power feeder works in combination with 9, 4-edged rotating feeder disks. The power feeder helps to push material through the rotating hammers, ensuring consistency of pulverization and treatment within the processed material. We at Murphy Products are both manufacturers and distributors. This means we fully know how each machine works and are able to assist you in ways most distriputors can not. We are always happy to assist you with any of our products. *Notes: Pricing is for states which will accept the Tier III Engine for emission controls. Currently, the State of California requires a Tier IV Final engine, and pricing is available upon request. he machines are available for international sales. Electric motors are available and pricing is available upon request. Prices do not include delivery; all pricing is FOB Oklahoma City, OK. Pricing is subject to change without notice.